I don’t use mayonnaise that often–one of those small jars lasts me for months. But I was in the middle of making some tuna salad today and realized I’d none at all. I considered making do with Dijon mustard, lemon juice, and herbs, then thought, why not make it from scratch? I’d often thought about it, but never tried. This snowy, indoor day seemed a good a time as any. Because I never use much, I searched online for a recipe that would result in no more than a cup, and found this one on the Epicurious site. 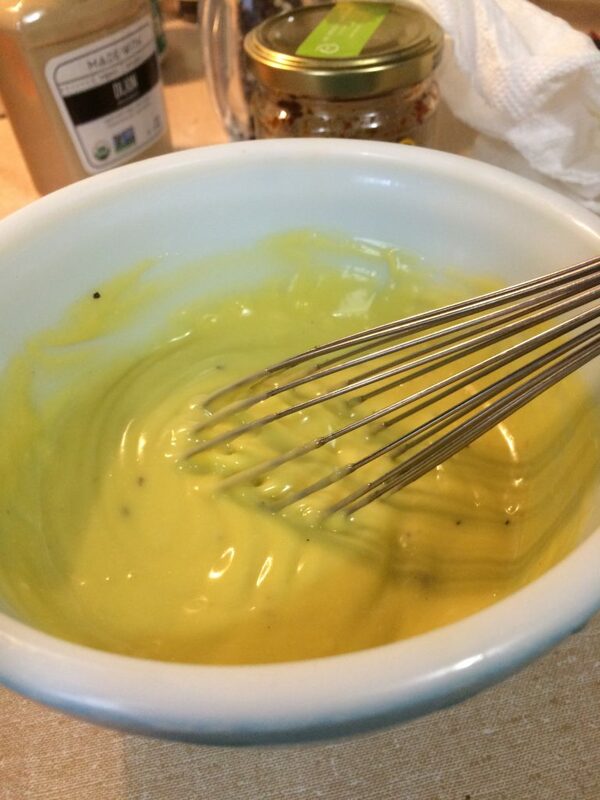 I dug out all the ingredients–Dijon mustard, cider vinegar, lemon juice, egg yolk, olive oil. Debated breaking out the immersion blender or the food processor with the small batch insert, and decided heck with it. I’d go old school and wisk it by hand. So I broke out the small hand wisk and got to work. 10 minutes active time, according to the recipe. I had always found those estimates laughably short, but hey, there’s always a first time. Well, guess what? It did indeed take 10 minutes or so of wisking time. I added the oil carefully, and had no trouble with the oil refusing to blend or later separation. My arm did get a little tired, but that was about it. As for the results, well, note the color. Definitely not white. I used a green, grassy olive oil that had a bit of bite, and that proved a mistake. I tasted the mayo expecting a mild, lemony flavor, and all I tasted was the olive oil. I now understand why past mayonnaise recipes I’d read advised use of flavorless oils like vegetable or canola oil. That said, I don’t consider this a total failure. I did use some of the mayo in tuna salad, where the taste of the fish and dried herbs balanced the olive oil. And next time I make it, I will use a flavorless oil. ← Previous Previous post: Capricon!